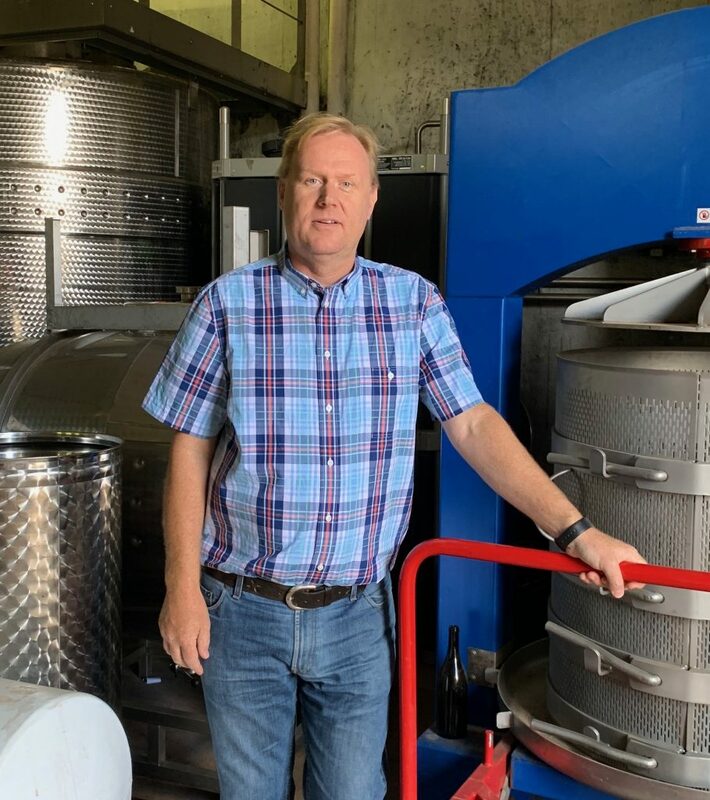 Richard Kershaw, South Africa’s first MW (Master of Wine), worked at wineries around the world (including Simi in California) before becoming winemaker at Mulderbosch and then, in 2012, starting his own eponymous winery in Elgin, South Africa’s coolest growing area. He makes site and clone specific Chardonnay, Syrah, and Pinot Noir from Elgin and other cool climate growing areas. His winemaking is non-interventionist with micro-vinifications and small productions of some of the very best wines, especially Chardonnay, being made in South Africa today. He is meticulous in his viticulture and winemaking, keeping detailed notes so that he can constantly learn and improve, and paying special attention to coopers and which barrels work best for specific wines. 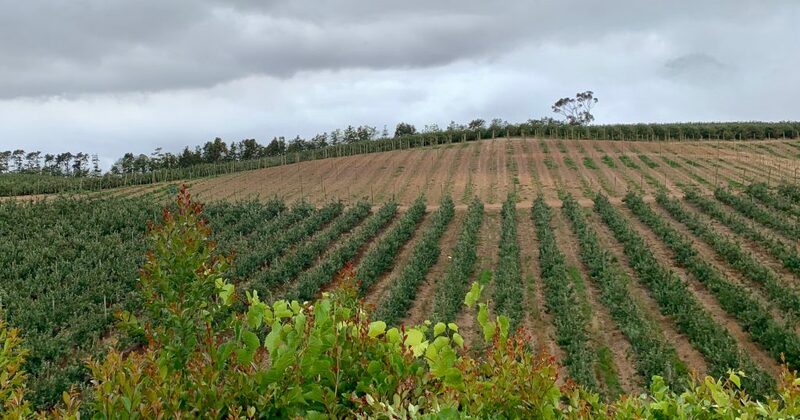 Richard has a special fondness for the terroir of Elgin with its high altitude, cool weather, high rainfall, long growing season, and diverse, very old soils of shale and decomposed granite and sandstone. A 1987 Stellenbosch University research project first identified Elgin as good grape growing territory, and farmers started planting grapes in 1989. Today there are about 800 hectares of vines, and Richard’s wines show the remarkably high potential of Elgin to make outstanding, cool climate wines. But the future for grapes in Elgin is clouded. This is above all else apple country, and farmers make more growing apples than grapes, thanks in part to Coca Cola, which purchased South Africa’s sparkling apple beverage Appletiser in 2017. Appletiser sources apples from Elgin, and Coke’s marketing strength (the goal is to make Appletiser a global brand) is likely to expand production and raise the demand for apples in Elgin and elsewhere. Vines are already being torn out for new apple orchards. Meanwhile, the price of land in Elgin is rising rapidly (80% over the past two years, says Richard), partly due to the abundance of water while other regions face a growing risk of drought. Reviews of Richard’s wines follow. The Deconstructed range of wines focuses on specific clones, soils, and sites within Elgin. The GPS range is wines sourced from cool sites located outside Elgin. The wines are produced in limited quantities. Kysela Père et Fils of Winchester VA imports Richard Kershaw wines in the US. Berry, Bros. & Rudd imports the wines in the UK. Richard Kershaw 2017 Clonal Selection Chardonnay Elgin 92 Light yellow straw. Precise nose of mineral accented citrus and honeysuckle. Beautifully delineated, focused but mouthfilling palate with a pronounced mineral character. Persistent finish with lingering lemony acidity. About 50 percent Clone 95, whole bunch pressed and matured in barrel until bottling. About 20% malo. Richard Kershaw 2017 GPS Series Chardonnay Lower Duivenhoks River 93 Delicate, precise nose with hints of lemon and flint. A finely sculpted wine that evokes oyster shells, savory sage. Mandarin pith and lemon zest notes persist on the extended finish. Made entirely from Dijon clone CY95. Part of the GPS Series, the vineyard lies east of Agulhas and 5 km from the sea on an escarpment of clay over limestone. Sees about 40% new 228L oak. Richard Kershaw 2017 Deconstructed Chardonnay Lake District Cartref CY96 Elgin 93 A single clone (96) grown on a single parcel from a single vineyard of Cartref soils (decomposed granite and quartz). Roasted grain, wet stones, and lemon peel aromas. Precise and tightly coiled with an intense mineral character and yellow fruit and citrus zest flavors finishing with a smoky gunflint note. Matured in 50% new oak. Richard Kershaw 2017 Deconstructed Chardonnay Lake District Bokkeveld Shale CY95 Elgin 95 Minerals and a hint of flint on the nose. The expressive minerality of this wine also shows on the palate with complementary light stone fruit notes. Aged in 50% new 228L oak aging for 11 months. Richard Kershaw 2017 Deconstructed Chardonnay Groenland Bokkeveld Shale CY548 Elgin 94 Perfume of flowers, minerals and citrus zest. The palate is dense and focused, almost chewy with an opulent mandarin mid palate and long, savory finish. Matured in 50% new oak that is seamlessly integrated with the wine. Richard Kershaw 2017 Clonal Selection Syrah Elgin 92 Enticing nose of black fruit complemented by hints of smoked meat and herbs. Excellent purity and restrained sweetness with rich blackberry and cracked pepper spice and an uplifting dark red fruit note. 9c is the principal clone. Aged 17 months in French oak. 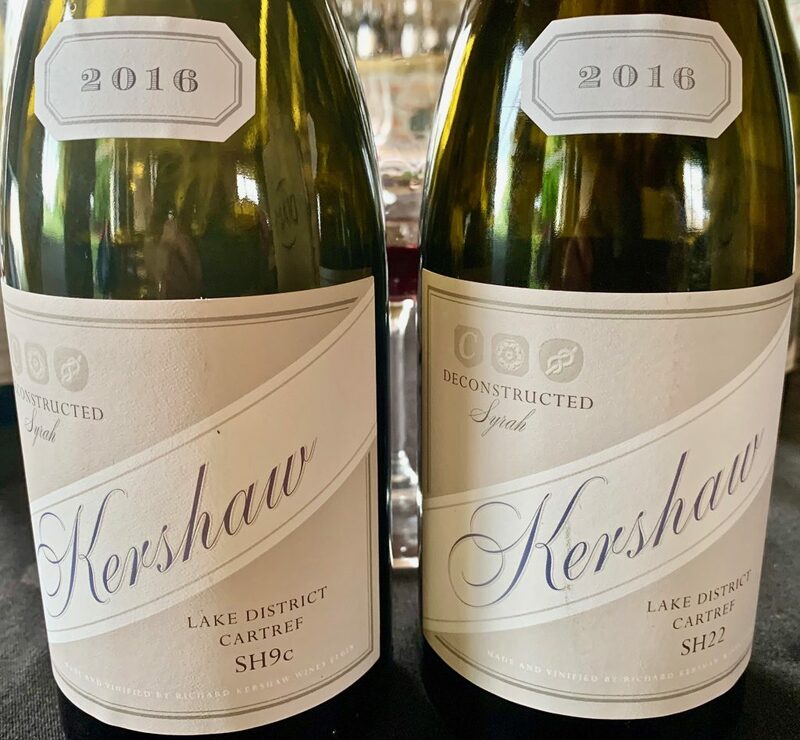 Richard Kershaw 2016 GPS Series Syrah Klein River 92 Beautifully perfumed of macerated dark red cherries, black fruit, and underbrush. Lovely purity in the mouth with dark fruit and pepper notes and a persistent aftertaste. Made from clone 1 bush vines grown near Stanford. Destemmed, sorted berries are fermented in open top bins with an extended period on the skins. After pressing, the wine goes into French barriques, 43% new. 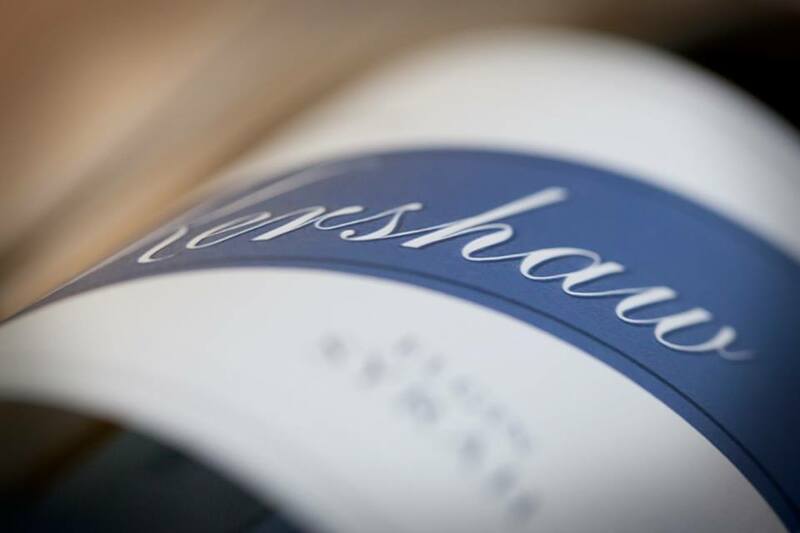 Richard Kershaw 2016 Deconstructed Syrah Groenland Bokeveld Shale SH9c Elgin 93 Vibrant, effusive aromas of blackberry with savory notes. Rich and ripe on the palate showing dense fruit flavors accented by lavender and cracked pepper. Aged 17 months in 500L French oak, 45% new. Richard Kershaw 2016 Deconstructed Syrah Lake District Cartref SH9c Elgin 93 Medium dark ruby. Spicy on the nose with uplifting notes of lavender and red plum. Bright and pure on the palate showing opulent, pure fruit. The vibrant character of this wine persists on the long, symmetrical finish. Made from a single parcel (the same one as the 22 clone Syrah) planted to the 9c clone. Matured 17 months in 228L French barriques, 45% new. Richard Kershaw 2016 Deconstructed Syrah Lake District Cartref SH22 Elgin 93 Rich, ripe fruit with a note of cooking spice on the nose. Very dense on the palate with terrific peppery black fruit (think St. Joseph) at the core and minerals. Long, graceful finish. Sourced from a single parcel of only the SH22 clone. Matured 17 months in 228L French oak, 45% new. This entry was posted in Chardonnay, Countries and Regions, Great Winemakers, Pinot Noir, Red Wine, Shiraz, South Africa, Uncategorized, White Wine, Wine Articles, Wine Type and tagged Chardonnay, Elgin, Featured, Syrah. Bookmark the permalink.